people Are Probably always asking You "what Else can I do to help?" We help Those people raise money for you. For FREE. Brooke raised $227.50 in Australia for A21. Tate's Team raised $2,685 in the USA for Not For Sale. Kyle raised £459.41 in the UK for Love146. New Funds (& New Friends). Raised for You. And the people who raised it for you felt empowered, more connected to you and your work and thankful they could do something specific to help! There is no magic pot of money. We know. This isn't a magic unicorn or a mythical dream from la la land, either, though. So far, it's been done every year since 2014 with teams raising amounts such as $1,641, $2,500 and $2,685 for NGOs such as Not For Sale, IJM, A21, Love 146, Hope for Justice, iSanctuary and Saving Innocence. Full disclosure, some NGOs had people raise in the hundreds of dollars or pounds for them, but also remember, these amounts were all raised with zero prompting, involvement or coaching from said NGOs, people just raised money for them... whereas WMFBolivia & HUG Project invited people to raise for them and people were raising between $515 and $2,675… each. So far, people in the UK, USA and Australia have raised pounds (GBP) and dollars (USD) and dollars (AUD), because they wanted to! Do you have people that believe in you and what you're doing? Imagine what a even a small group of them could raise for you with just a little prompting, encouragement and appreciation from you, along with some direction and coaching from us, and by joining in with a community of people supporting, encouraging and cheering one another on! What would you do with an "extra" $227, £459 or $2,685? Or even $5-10K? Or whatever amount would make a difference? What would it mean to you, your team, the people you're working hard to help avoid, exit or be restored after modern slavery/human trafficking? What would you do with an "extra" ______? Now, could more money come from your current sources (during the biggest giving month of the year)? And so, those possibilities aren't great options for new funds, during the biggest giving month of the year! P.S. Who has time to do more donor communication, care or follow up than you're already planning? Your team doesn't have the time. Time & Money, Money & Time. It can feel like there's not enough of either. You and your team already have plenty to do in Freecember. The people you're helping don't stop needing help. Traffickers aren't stopping for the holidays. Some are even gearing up to traffick around one of the biggest events of the year in the USA (the Super Bowl). You've got enough on your plate. And you and your team legitimately need to take appropriate time to rest and be with family and friends. You can't do everything. And you can't do it nonstop. So, you're working to have the money you need. How can you even think about "extra?" Take a look back at what the "extra" would mean? What if someone, or a whole group of someones, who care about you and your organization, raised that "extra" amount for you? What if, this year, you empower the people who already love you to help you connect with new friends and raise new funds for you? And, along the way, they learned and grew and felt more connected and empowered and shared with their friends about your amazing organization and the real difference you're making to real people? Let's talk for a moment about people. Two groups of people specifically. Those who know and love your work & those who don't yet know and love your work. Let's start with those who don't know you yet. Where will you connect with these new friends, that is, new people who will care about, believe in and financially (and otherwise) support the work you're doing? Thankfully, and thanks to awareness raising days, organizations and events, more and more people are becoming aware of human trafficking. Often, their burning question is: what can I do? Followed closely by, who should I get involved with or give money to? They want to give to something making a difference (like your non-profit). But, how do they know which to give to? How can they feel confident their money will make a difference? They see "Give Now" buttons on every site. How do they come to know, trust and give to you? Even big organizations with big marketing budgets have to overcome the question: "how do I feel confident about giving money to this organization with a website? Anyone can put up a website." And you don't have a big marketing budget or marketing department. Enter: the people who already know and trust and believe in your work. They are the ones who can introduce you to their friends... naturally, via their social networks, where they already connect with and share with their friends, new people you may never have the opportunity to meet or connect with in a meaningful way. What you do to honor and grow the connection once you've been introduced is up to you. But the key is it's not a cold landing on your website or a scroll past a social post. New potential friends are introduced to you by someone they trust, so they check you out in more depth. Taking or leading a Freecember challenge (and introducing new people to your work and raising funds for you) is something within their power to do. Maybe they're giving. Maybe giving monthly. If they're a praying person, they're praying. They care, and they want to do more. Maybe they help you with your fundraising event. Maybe some volunteer in other ways. Maybe some have asked you: what else can I do?" (besides giving or what they're already doing). Maybe you already have great answers to that question. Maybe you don't. Either way, for some of the people that ask you (or even the ones who don't ask, but would do anything to help you if you asked), one of the things they can do is help you raise your reach and resources. What do we mean by Reach & Resources? It's new friends and new funds. Connection and coin (if we can be direct and use a little slang here.) More people and more money, to put it bluntly. Where do people go when they're looking for a dentist, a tutor, a realtor, a movie worth watching, a... you-name-it? Their friends. Whether in person or online, people go to people they know and trust to find out who to trust. And people naturally share about what they love and believe in with the people they know. The same is true for anti-trafficking. New potential friends find out about you from their friends in natural and genuine ways! And, they give to you… because their friends ask on your behalf. Sometimes, maybe just because they want to support something their friend cares about. This isn't new or unique. There are multiple fundraising platforms and initiatives helping people raise hundreds and thousands, totaling multiple millions of dollars, for all kinds of charities doing all kinds of work. People raising funds. And happy to do it! Do you have someone (or lots of someones) that would raise funds and friends for you? Now, Freecember won't be a fit for everyone. That's okay. 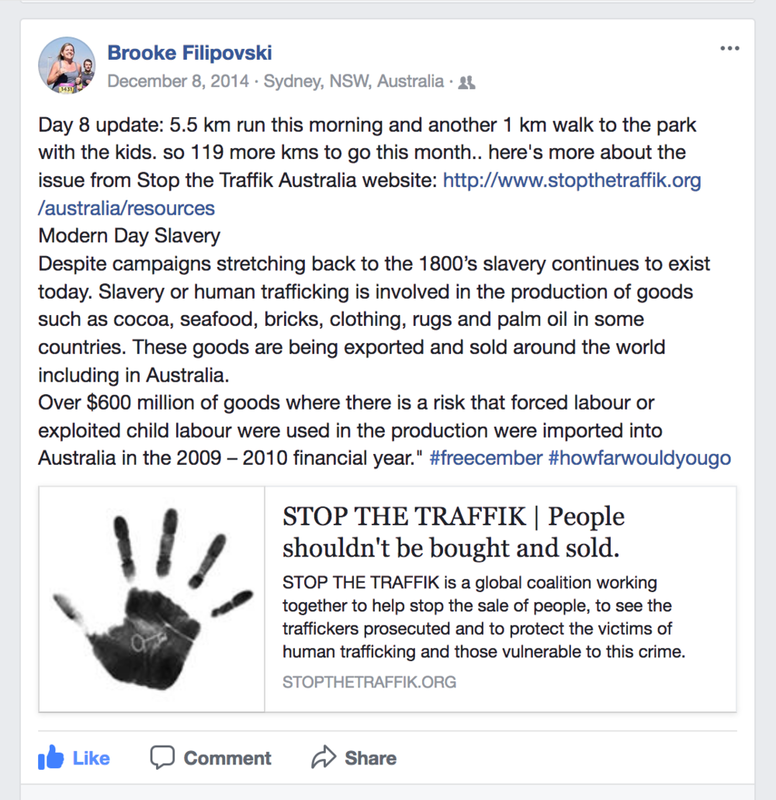 You aren't working to address an aspect of modern slavery/human trafficking. If it's not a fit for you, no worries. We're thankful for you and what you're doing. Maybe you know the leader of an non-profit it would be a winner for or someone who would enjoy the opportunity to join in and raise funds and friends for an non-profit they care about. Let them know about Freecember and the possibility to raise new funds and new friends for their grassroots non-profits. a specific amount that would make a difference and the difference it will make (if not right this moment, then fairly soon, by the time you're ready to invite some people to be your team captain(s)). Join us this Freecember, and have new funds & new friends, raised for you. P.S. Freecember touches 0% of money raised. Actually, we run Freecember entirely pro bono/out of pocket. Our heart is empowering everyday people to fund the frontlines of freedom by raising money for an anti-trafficking non-profit they care about. That's you! 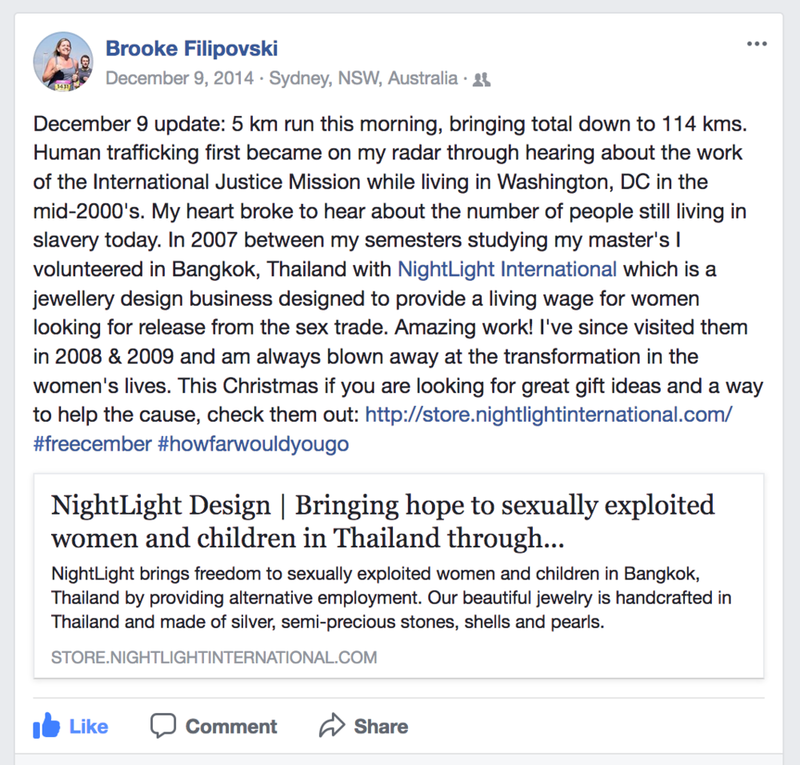 How exactly does Freecember help people raise funds and friends for grassroots anti-trafficking NGOs? Register your interest now, and we'll send you a short explanation. Interested in finding out more specifics? Fill in a few fields below & Click "Send Me the Details." More money. Money to do that project or make that something possible. From people that wouldn’t have given to your organization (because they aren’t connected to you and your work… yet). More people finding out about your work from someone they know and trust. People that would bounce from your web page, people that may never see one of your social posts are introduced to you and your work. They begin a relationship with you and your organization based on an introduction from a friend. raised for you. For Free. By people happy to do it. Give your current supporters something they can do. Current Supporters. Feel a part of something bigger than themselves or even bigger than your specific organization, they’re part of a global movement to stop slavery. Submit your email address to receive details of how Freecember helps you raise funds and friends.